Feedback on the 2017 event has been excellent. We regard these forums as an integral part of our service to our clients, and very much encourage our clients to join us at our next event. 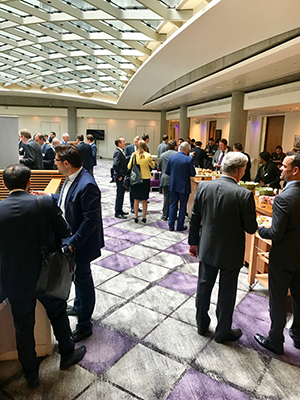 On 11th September 2017, Infospectrum held its annual Counterparty Credit Risk Forum in London, providing an excellent opportunity for our clients to network with over 100 risk managers, ship owners, lawyers and financiers and, of course, the Infospectrum team. Our forums, which are open to all Infospectrum clients at no cost, are also designed to add to our client’s industry knowledge, with a hand-picked selection of speakers. The morning session was based around the fundamentals of our sector, from the perspectives of market forecasts, the application of risk management, and the avenues available should such management fail. Stephen Gordon, the Managing Director of Clarksons Research, set the scene by bringing the audience up-to-date with a detailed outlook of the shipping markets. This was followed by a presentation on the key challenges faced by risk managers in today’s environment by Maria Taylor, former Head of Credit at EDF Trading Ltd, and now an established consultant in the risk management sector. Maria’s talk sparked a number of questions relating to the downsides of performance-related bonus structures. Finally, Eleanor Midwinter, a Senior Lawyer from Wikborg Rein LLP, spoke about the benefits of knowing your counterparty, and how such knowledge can help ascertain whether legal action is worthwhile. Our late morning session started with a panel of four experts from the shipping and banking sectors talking about the availability of alternative capital in shipping. Moderated by Frank Pedder from Auld Partners Ltd, and supported by Robin Perkin from Breakwater Capital Ltd, Mikal Boe from DCC Bulk Transport Pte Ltd and Stacy Zhang from ICBC Financial Leasing Co., Ltd, the panel members gave their own perspective drawn from their diverse backgrounds on alternative capital, and faced questions from the audience on asset security, sale and leaseback arrangements and the establishment of Ultimate Beneficial Ownership. Finally, Infospectrum’s team added its own flavour, with Senior Analyst Ian Staples providing an illustration of the flaws in seeking patterns in data, and Magnus Evjebraten, Infospectrum’s Chief Technology Officer, providing an introduction to the new Infospectrum Counterparty Management System (ICMS). Infospectrum is delighted to announce that shipping trade and finance specialist, Anthony Elliott, will join his brother Frank in our London office. Infospectrum continues to add strength to its Asian operations with the arrival of Nikolaos Deonas (Nikos) in the Singapore office. Singapore’s latest move to clean up its bunkering sector has already claimed its first major casualties, following the high profile closures of the bunkering operations of Panoil Petroleum Pte Ltd and Universal Energy Pte Ltd.
We will discuss the direct impact of these moves soon, but it is worth noting that there are wider forces at play here, not least Singapore’s mandate forcing the use of mass-flow-metres (MFM), and the increasing reluctance of lenders to finance the physical supply business. There is evidence that Singapore’s Maritime Port Authority (MPA) is keen to reduce the number of accredited suppliers from circa 50 at present (already down from over 100 in 2012), to less than half this number (note that Fujairah, the 2nd largest bunkering anchorage with annual volumes of circa half of Singapore operates with less than 20 licenses). The implementation of the MFM rule alone has seen an unprecedented imposition of barging fees, and delivered prices that are now consistently higher than ex-wharf. The MPA’s greater willingness to issue demerit points has also seen the revocation, or non-renewal, of bunker fuel supplier and/or bunker craft operator licences. This uncertainty appears to be already making itself felt in the trade finance community, with reports that major banks are becoming more reluctant to lend to physical suppliers, which may increase costs to unsustainable levels (particularly for smaller suppliers); in an attempt to bring more transparency we may have to first navigate through even darker waters. Panos Panousis of Infospectrum argues that caution should be exercised in how terms such as ‘consolidation’ and ‘restructuring’ are being applied to the raft of changes underway in the industry. To read the rest of the piece by Panos Panousis and Bunkerspot click here. "Although a highly discreet company, InfoSpectrum Ltd grants ShippingWatch a glimpse of the most severe pitfalls." Maritime companies face plenty of risks when they enter into a deal with a counterparty with whom they are not familiar, or whom they thought they could trust. Although a highly discreet company, InfoSpectrum Ltd grants ShippingWatch a glimpse of the most severe pitfalls. 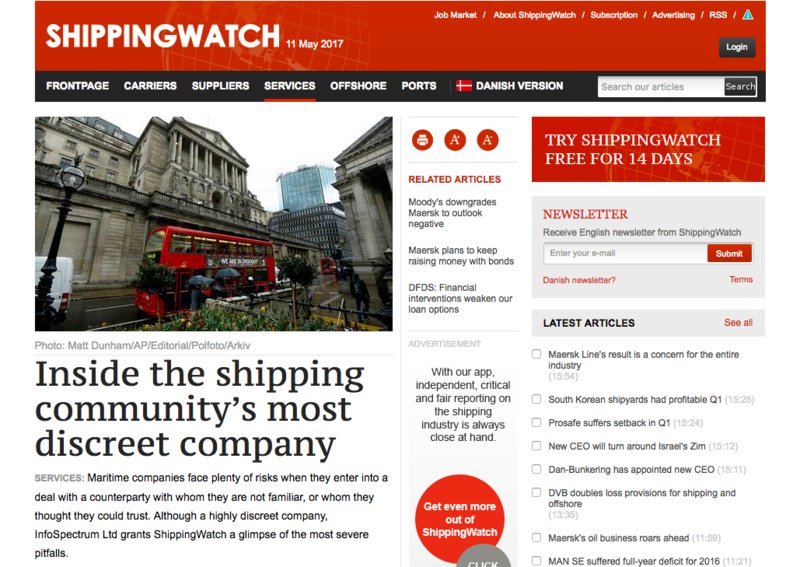 Read more of our interview with ShippingWatch here. Infospectrum has further expanded its global presence with the hiring of experienced shipping analysts, Felix Yamasoto and Ms Juleng Koh, who will be based in Stamford and Vancouver, respectively. On 12th July 2017 Infospectrum held its first Asian Counterparty Credit Risk forum at the Intercontinental hotel, Singapore. Already well established as an eagerly anticipated annual event in London, credit industry participants had voiced a desire to see a similar gathering in Asia. With a total of six sessions, the forum was curated particularly with Asian shipping concerns in mind. 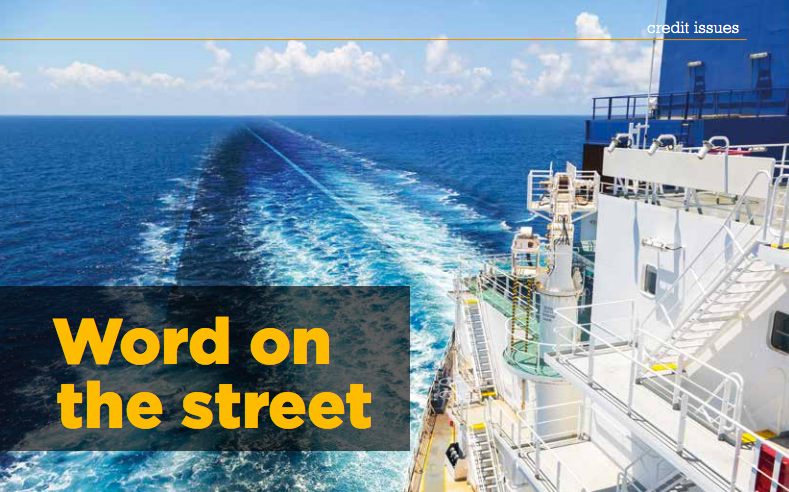 Ocean Shipping Consultants’ Jason Jiang began proceedings with the tough task of delivering a concise look at the topic-du-jour of China’s One Belt One Road initiative, and the implications for existing trade routes. 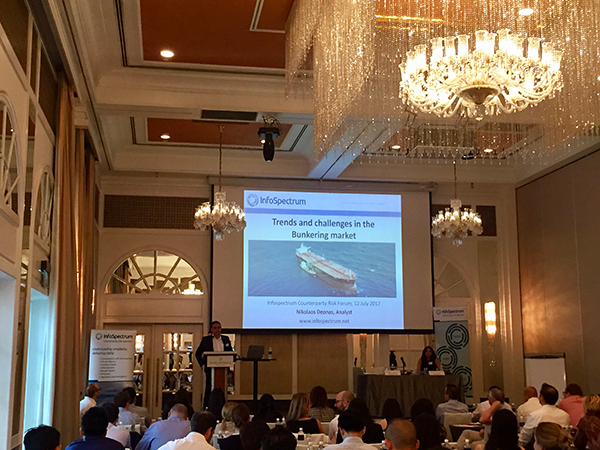 This was followed by a shipping market overview by David Jordan, General Manager of Research at Clarksons Platou Asia. As it is well known that we all would like to have a crystal ball, both sessions were well received. Moving on to a look at the local bunker market, Infospectrum’s own Nikolaos Deonas took the stand. Having previously held the position of Head of Bunker Trading at Cargill, Nikos delivered an insightful overview of the challenges and trends facing the sector. Alongside Nikos, Tina Anand, who works from Infospectrum’s London office caught the audience’s attention with her look at how one could mitigate third party risk in the context of anti-bribery and corruption regulation. As compliance becomes increasingly central to trade and counterparty decision making, clearly the need to protect your company from unintentional, but potentially damaging third party exposure is of great concern. Up next, the UNCITRAL Model Law on cross-border insolvency. Lauren Tang, Partner at Stevenson Harwood (Singapore) Alliance guided the audience through Singapore’s quest to become the hub for international commercial arbitration, and following on from the theme of insolvency the final session of the morning focused on company failures, with Hanjin as a case study. Dean Hilton, one of the company’s founding partners, now based in Australia, delivered a sobering account of the demise of one of the biggest shipping companies in the world. Dean tracked several key factors including the inherent weakness in the structure of the Chaebol system, poor performance and ever more desperate borrowing, with corrective measures taken only when too late. The case study also served to highlight the importance of counterparty vigilance and the help that a third party, independent specialist service can provide in sounding early warning signals. Finally, Infospectrum’s Managing Director, Panos Panousis, took a few moments to introduce our new Infospectrum Credit Management System which will be rolled out 3Q 2017. The system will be available complimentary to our annual open-access subscription customers and will provide a comprehensive, compliance-focused counterparty risk management process which will enhance the customer experience alongside Infospectrum’s present database access package. A glance at the audience who took advantage of the opportunity to network at the ensuing lunch with fellow industry participants only served to confirm the breadth and depth of Infospectrum’s presence in the field of counterparty due diligence, with customers representing all fields of shipping, commodities, legal and financial services. Feedback was very positive and as Panos commented, Infospectrum is very happy to have taken the initiative in Singapore to give something back to the industry. Infospectrum will host its forum in London in September, and without doubt will build on the success of its inaugural Singapore forum in 2018. With the Greek shipping industry continuing to drive demand for our in-depth due diligence reports, Infospectrum has added two more analysts to its established Greek desk. With the Greek shipping industry continuing to drive demand for our in-depth due diligence reports, Infospectrum has added two more analysts to its established Greek desk. The new members of the team will work closely with our established team, which includes individuals that have covered the Greek shipping sector for over 30 years. Francis (Frank) Elliott graduated with a BA in International Politics from King’s College and continued his education at CASS Business School where he attained an MSc in Shipping, Trade and Finance, with distinction. During the course of his studies he took on various internships in the private equity & asset management space with a focus on shipping. He will be based in Infospectrum’s London office. Another CASS graduate, this time with an MSc in Insurance & Risk Management, Efthymios Yfantis has joined Infospectrum’s Head Office in Oxford. Having also qualified with a BSc (Hons) in Business Economics and Finance from the University of Surrey, Efthymios worked for over 3 years with Minoan Lines (part of the Grimaldi Group) where he was responsible for managing the company’s cash flow and credit lines, as well as involvement in Business Strategy projects. While in Oxford, Efthymios has completed an MBA at the Said Business School. Infospectrum’s Managing Director Panos Panousis comments “I am extremely pleased that Infospectrum continues to attract graduates and young professionals of the calibre of Frank and Efthymios. We have covered the Greek market since our formation in 2000, and we have a reputation for an in-depth understanding of the sector and its participants; I expect Frank and Efthymios to help us build on this reputation”.